February 19 is Flag Day in Turkmenistan. The day celebrates the adoption of the first nation's flag after gaining independence from the Soviet Union. These changes promoted adoption of a new flag, that would be used to represent an independent nation. Turkmen SSR flag was used for a year after gaining independence, till a new flag was adopted on February 19, 1992. 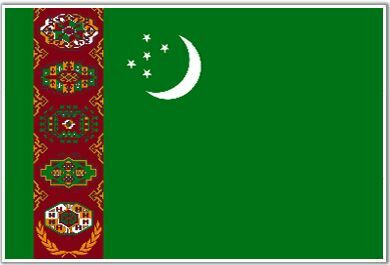 The first Turkmen flag was very similar to the current flag: a green field with a vertical stripe near the hoist side containing five carpet guls (used in carpet designs), a white waxing crescent moon, that is typical to symbols of Islam and Turkey, and five white five-pointed stars. The first flag of Turkmenistan was used to 1997. The flag was changed and olive branches appeared on the red stripe of the flag. These changes were made due to Turkmenistan achieved a status of permanent neutrality, that was accepted by the United Nations General Assembly on December 12, 1995.